St. Johann in Tyrol offers everything what a perfect ski holiday needs - well-prepared slopes, spacious sites and modern lifts that bring you safely on the mountain. The location of St. Johann in Tyrol can be described as an idyllicly located community in the Austrian region of Tyrol. The special feature of St. Johann constitutes its location within a pot. That enables St. Johann to stay untroubled by foehns, but getting remunerated by fertile snow fall. In the north of the 9,000- inhabitants counting community, you can enjoy a stunning moutainous massif - the Wilde Kaider. 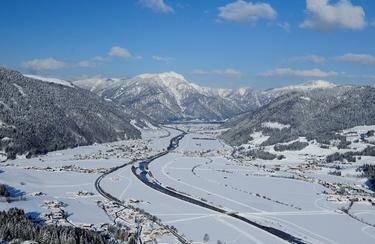 One of the most beautiful ski regions of the Kitzbühel Alps you will have below the Harschbichl. In the afternoon, you can relax after a eventful day in St. Johann. With its direct proximity to the ski resorts in Kitzbühel you are also surrounded by many more ski regions to discover. If you would like to snowboard or prefer skiing and cross-country skiing - you will get rewarded with Tyrol's best programm of activities.